From the start, Luis Barrera has proven himself to be mature and wise beyond his years. In a relatively short period of time, these traits helped Luis earn a place on MEDIC’s SWAT team after only being a Paramedic for a few years. Shortly after being named to the SWAT Team, Luis was promoted to Field Training Officer, where he displayed his innate leadership talents. This position is only bestowed on the Agency’s highest performers. After being named as a Field Training Officer, Luis made the decision to become a Relief Operations Supervisor. Composed of talented men and women responsible when a full time Supervisor is out, Relief Operation Supervisors set an example to their fellow employees. He is smart, calm, and considerate. Luis treats every patient with kindness and respect, and provides incredible medical care. 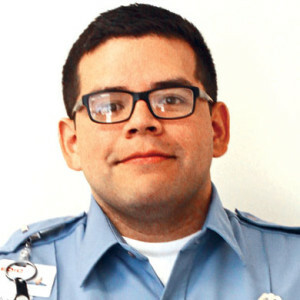 Luis never fails to lift the spirits of a coworker with a kind word or to take extra time to ensure a coworker really understands MEDIC’s goals and their role in helping attain them. Luis is a very strong clinician who works hard to mentor and provide advice and guidance to his fellow employees. Finally, Luis has exceeded all expectations by participating on improvement projects and is making a huge impact with his insight, input, and work. He has developed into a well-rounded, high performing employee who manages to balance the interests of our patients, our people, and the Agency. Not only can he be relied on to put his best foot forward every day, but he continuously strives to make MEDIC a better place to work.